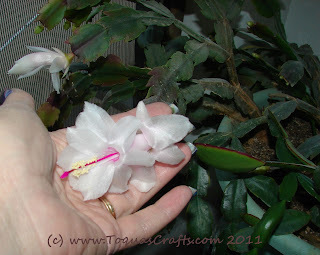 I have had several kinds of Christmas Cactus. In this particular pot I actually have 3 or 4 different kinds. 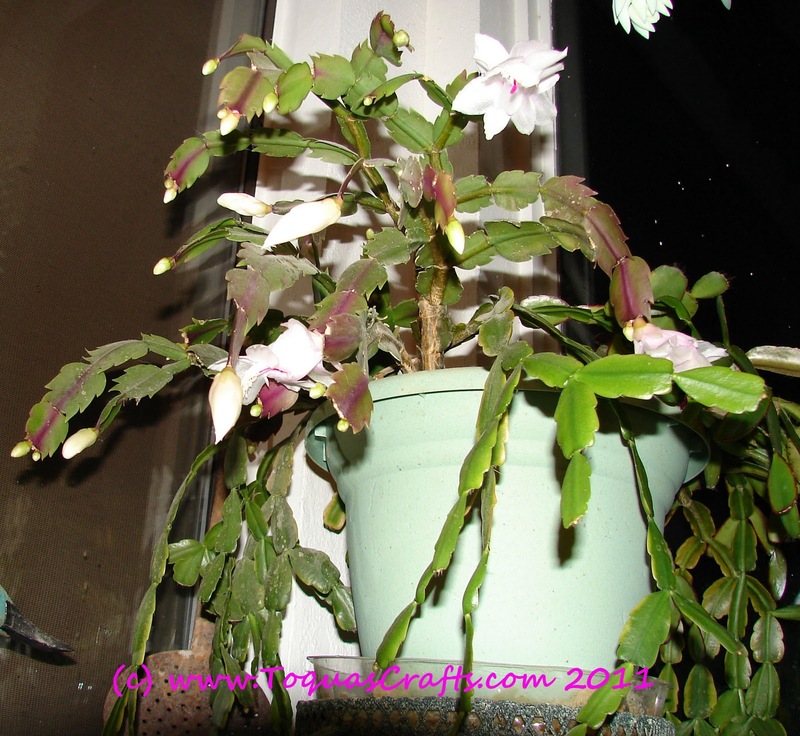 This creates an active pot, as truly, not all Christmas Cactus bloom at Christmas. According to this Wikipedia article Schlumbergera (the scientific name) is known as Christmas or Thanksgiving Cactus. 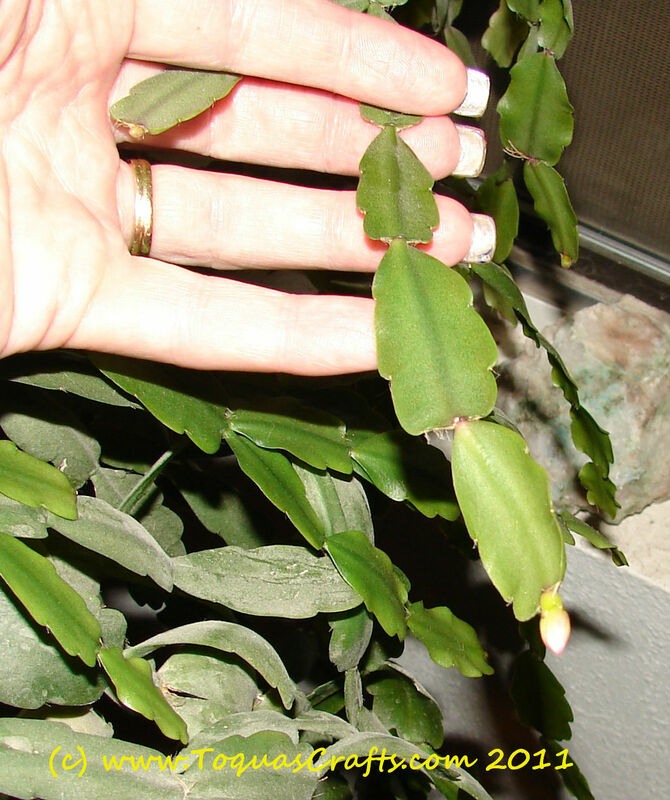 A similar plant known as Hatiora or Easter Cactus has similar leaves but has different flowers. I believe all of the ones I have are "Christmas Cactus". I've known for many years that they actually come from the jungle and because of this requires more water than what we think of when we say "cactus" (the desert type cactus). I hope I don't miss all those buds blooming while we're gone for Thanksgiving!! This one I've had the longest and it is covered with blooms... although it is hard to see them in this picture. This plant produces a pink blossom. MANY years ago a neighbor gave me this as she was preparing to move and didn't want to take it with her. I remember my paternal grandmother had a Christmas Cactus very similar to this one. I can tell from this picture it is time to put the pot and plant in the shower. The dust shows up more here than it does in person! Do you have some that bloom in the winter? 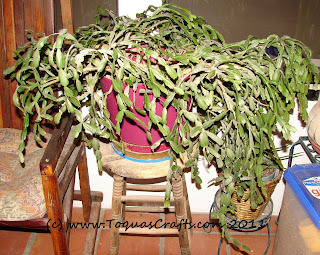 Are you like me and prefer plants that you can ignore as opposed to those that need a lot of care? I'm laughing at the idea of giving your plant a shower! It does make sense though. I saw a house once where the shower bumped out into a glass wall with shelves and was loaded with tropical plants. It was AMAZING! 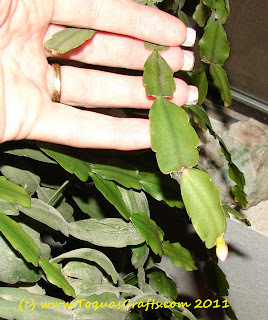 I have a Christmas cactus that I would joke was a Thanksgiving/Christmas/Easter cactus. It would bloom three times a year. I never deprived it of light, but I once heard to let it go dry for the month of July. We moved to a new place last spring, and it looks like my cactus won't be blooming this year. Maybe next year, when we once again have a wall of sunny windows where we can place it. Thanks for sharing your information.